“a long time ago in a galaxy far, far away” Well not really only across the pond in the city of angels Malo One aka MALOWRX has taken a 3.5inch COARSE OMEN and turned him into a little “Porg” from the upcoming new Star Wars film, The Last Jedi! 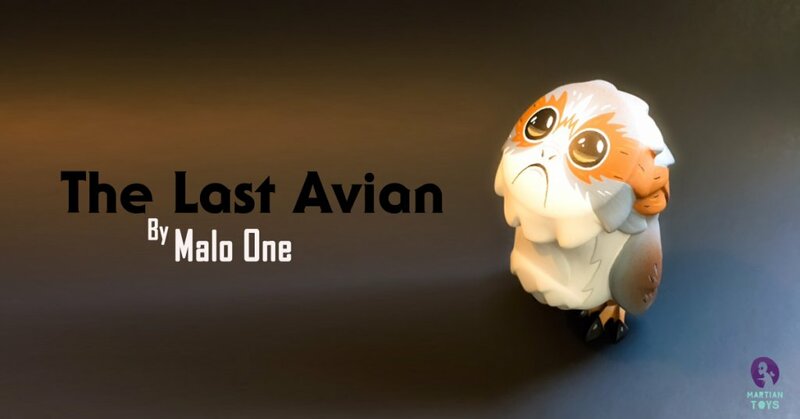 Presenting “The Last Avian” – a custom 3.5” Coarse Omen by artist, Malo One. The Last Avian is based on Millenium Falcon’s new co-pilot, a Porg that steals the show allegedly in the new Star Wars film, The Last Jedi (In Cinemas December 15). The Last Avian is up on preorder for $100 on MartianToys.com. Preorder is up now on MartianToys.com please allow 4-6 weeks. However, Mike feels confident he can get the first 6-8 done in time for the movie release s the early bird gets the porg as they say. May the force be with Malo One. Along with Coarse custom, please check out Nathan Hamil’s new enamel pin – Porgy Pig. It’s 1.75” tall x .75 “ wide and comes carded and clear wrapped. Just $10. Now through December 31st, if you spend $125 or more you will receive free domestic shipping and if you spend $200 or more free global shipping. A great time for those around the world to stock up! Just use code XMAS. A little more about Porgs….